12th April 2012. Introducing a Places Forum feature, the Australian Kids Road Atlas and the 4th edition of the Kimberley Atlas and Guide. Plus we welcome "Ray's Outdoors" as a new business member and announce the winner of the March Shop Review Prize Draw. Here's news of what's on special, and what's been happening on ExplorOz.com over the past fortnight! We've dropped the price of the Globalsat BU-353 from $60 to only $49.95! 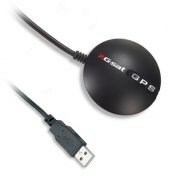 That's our lowest price ever, so if you've been thinking about gettting started with laptop navigation, now's the time. Already have one? At this price it's a great idea to get a spare for your other vehicle or in case your current unit is damaged. So what are you waiting for - buy yours today. To coincide with the BU-353 price reduction, our GPS & Digital Map Starter Packs have also been reduced, see the item page for current pricing. Recent changes to Places mean you can now enjoy a fresher layout that is more user-friendly and simple. See this example - Mindebooka Hill, WA. The main Places index page is currently unchanged, however we are working on upgrading the entire Places layout and search functions to provide you with a superior online experience. Our Places database still remains the largest offering of free downloadable POIs for Australia - including GeoScience Australia data layers (by licence) and custom layers to suit outback travellers. What makes ExplorOz Places unique is that not only can you obtain the GPS position and altitude data, you'll get every bit of possible information available for that Place (description, address, phone, zoomable map (topo 250k, satellite, and streets), weather/climate station trends to help you plan ahead PLUS we let you upload photos, and write reviews/questions/comments to add your knowledge to this free public service. ExplorOz thrives on the collective ethos in our community that fosters the sharing of knowledge and experience for the benefit of others, so please remember to put your photos, reviews, and comments into Places you've been. Many of our regular Forum users will have noticed that if a post appears to relates to existing content we've got elsewhere on the site (in Trek Notes, Articles or Shop) then a box with a link to that page will appear in the top right corner of the post. We've now added a further option, which allows us to select relevant Places to link to your post in the same way. Keep any eye out for these linked pages, as this is our way of guiding you to further information in other sections of the site. Please welcome our newest business member, Ray's Outdoors. Each month we have a random prize draw taken from reviews submitted for items listed in our shop. Congratulations to March's winner - David W4 for this review. 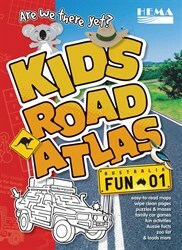 The new Hema Kids Road Atlas features 20 atlas pages covering all of Australia, as well as activies puzzles and games to keep kids entertained while on the road. At only $14.95 it's top value and a great gift idea! Dreaming of a Kimberley trip this year? This new edition Atlas and Guide has all the info you need to start planning!